WSU entomologist Rich Zack presents at a 2015 Pullman Kiwanis meeting. January 3 – No meeting on January 3, 2019. Happy Winter Holiday!! December 27 – No meeting. Happy Winter Holiday / WSU Closed Week!! July 12 – Kiwanis begins meeting at Banyan’s at the Ridge Pavilion. 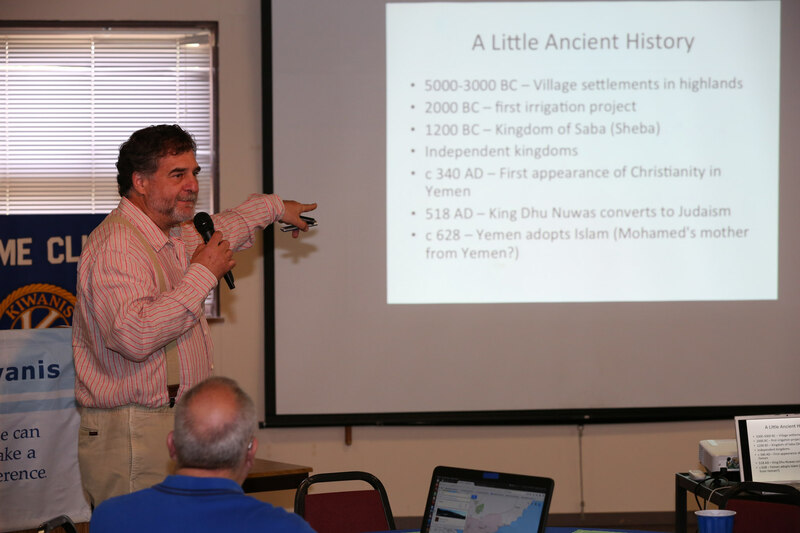 April 5 – Bob Morris, Chief Engineering Service Officer at SEL on “International business tidbits, such as how SEL helps children in foreign countries, challenges of doing business outside the USA, some of the projects around the world & photos of some of the locations. January 18 – Kerry Swanson, NWPB Radio Station Manager, on changes to Northwest Public Broadcasting, and NWPB news manager Scott Leadingham on news and the importance of journalism in today’s society. December 28 – No meeting. Happy Winter Holiday / WSU Closed Week!! November 2 – Mary Collins, League of Women Voters: overview of LWV activities in the Pullman area, including candidate forums, studies of issues, voter registration, more. November 9 – Kim Barnes, best selling author from the University of Idaho, on her work and writing. Author of In the Kingdom of Men, a best book of 2012, A Country Called Home, a best book of 2008, and In the Wilderness, a Pulitzer Prize nominee. She is a professor of English in the MFA program. November 16 – Mindy Thorp, community engagement specialist, about activities of the Girl Scouts of Eastern Washington and Northern Idaho. November 23 – No meeting. Happy Thanksgiving everyone! November 30 – Joal Lee, Assistant Dean, Director of Instruction, and English and Humanities Instructor at Spokane Falls Community College, Pullman. He’ll update us on SFCC activities and programs in Pullman. October 12 – Lihnda Sagen and Margaret Gollick, co-presidents, PTA, Jefferson Elementary School, on Pullman School District’s Weekend Snack Pantry Program run by PTA volunteers and community members with support from businesses, individuals, and community organizations. October 19: Aaron Riley, Regional Long-Term Care Ombuds for Eastern WA, overview of Washington State Long-Term Care Ombudsman advocates for residents of nursing homes, adult family homes, and assisted living facilities. January 19 – Cornell W. Clayton; Director, WSU Thomas S. Foley Institute for Public Policy and Public Service and Thomas S. Foley Distinguished Professor of Government. “A look back at the 2016 election cycle (local, state and national).” NOTE: His program will start promptly at 12:15 p.m. due to teaching responsibility. December 22 – NO MEETING – MERRY CHRISTMAS TO ALL!! December 29 – NO MEETING – HAPPY NEW YEAR 2017!! November 24 – NO MEETING – HAPPY THANKSGIVING TO ALL!! June 29, – Chris Opheim, Spirit Coordinator and Head Cheer Coach for the Washington State Spirit Squads. May 5 – Dr. Troy Bennefield, Director of Athletic Bands, Associate Director of Bands, and Assistant Professor of Music at WSU. May 26 – Pullman Mayor Glenn Johnson and City Supervisor Mark Workman, updating Kiwanis on the “state of the city” and other City of Pullman news. March 24 – 3rd annual Community Service Celebration, speaker Mack Strong, former Seattle Seahawks fullback for 14 seasons, founder of TEAM-WORKS Foundation that empowers disadvantaged youth and their families. December 3 – Bill and Susie Skavdahl lead the club in a holiday sing-along. December 24 – MERRY CHRISTMAS TO ALL!! No meeting today. December 31 – HAPPY NEW YEAR’S EVE TO ALL!!! No meeting today. November 26 – HAPPY THANKSGIVING TO ALL!! No meeting today. October 29 – Jeff Guyett on Community Survey overview – United Way, CAC, Pullman Regional Hospital and other agencies are partners in obtaining this community survey within Whitman County. March 12 – David E. Whitehead, Vice President of R&D, Schweitzer Engineering Laboratories, Inc.
January 1 – HAPPY NEW YEAR TO ALL!! No meeting today. January 8 – KIWANIS ORIENTATION for new and continuing members: learn about KIWANIS! December 25 – MERRY CHRISTMAS TO ALL!! No meeting today. November 27 – HAPPY THANKSGIVING TO ALL!! No meeting today. June 12 – Steve Nugent, WSU Women’s Soccer coach, Coming Soon: a World-Class Soccer Facility at WSU Pullman!! May 1 – Police Chief Gary Jenkins, on I-502’s impact on law enforcement plus information for the public. May 8 – Fire Chief Mike Heston, on the Grove fire. Kiwanis member and Pullman Mayor Glenn Johnson. Bring a guest to join the celebration. January 2 – NO MEETING. HAPPY NEW YEAR! WELCOME 2014! January 30 – Jeremy Briggs-Roberts, Director, Washington Idaho Symphony, on the spring season and future plans. December 26 – NO MEETING. HAPPY HOLIDAYS! November 14 – Cornell Clayton, WSU political science professor and director of the Thomas S. Foley Institute for Public Policy and Public Service, on civility and democracy. November 28 – NO MEETING – HAPPY THANKSGIVING!!! October 31 – HALLOWEEN – Club meeting cancelled so everyone could help with WSU football parking fundraiser. August 15 – Desiree Gould, Asst. Principal, PHS, speaking about new school programs. July 4 – No meeting, cancelled for the 4th of July. May 9 – Engineering applications: Clint Cole, President, Digilent Inc.
January 17 – Cotton Sears, Bishop, Who Are the Mormons? January 24 – Dave McKenzie, The SCORE Association, volunteer arm of Small Business Admin. December 13 – Lincoln Middle School Jazz Band. Invite a friend! December 20 -Christmas sing-a-long with fellow Kiwanians. Led by the Skavdahls and Toni Sarai-Clark. Invite another friend! June 7 – Club Business Meeting. February 2 – Ed Harrich, R.N., Director of Surgical Services, Robotic Assisted Surgery with DaVinci technology at Pullman Regional Hospital. August 11 – Weekly meeting is the Stuff the Bus kickoff, noon at Dissmores. Kiwanians with community and education leaders. June 3 – Patrick Merry, winemaker, Merry Cellars of Pullman..
June 10 – Edmund O Schweitzer III, President, Schweitzer Engineering Labratories, Pullman. May 6 – Election of 2010-11 Officers. Program: Nancy Hindman and Linda Graham, Inland Northwest Community Foundation’s Relationship to Pullman. Members of Pullman Advisory Committee (Bill Skavdahl, Doug Cox, Melinda Dutton, Penne Pierson and Bob Patrick) will likely attend. May 13 – Rep. Susan Fagan, on her thoughts from the perspective of a first-time Washington legislator, joined by Rep. Joe Schmick. May 20 – Sen. Mark Schoesler will present his thoughts and perceptions on the regular and special sessions of the Washington legislature. May 27 – Honoring our war dead. Bob Patrick is working with Bob Rehwaldt who is arranging a program in conjunction with the American Legion and ROTC. to help Push America – Journey of Hope. — Sandra Woodrow: How to Help with Stuff the Bus! June 11 – Grant Norton, “Imagine Tomorrow”: A high school competition for progressive minds. May 7 – President Sarah Hanks – Increasing membership and responsibility of being a sponsor. May 28 – Mike Crow – Resource Officer Pullman Police Dept, role at the Middle and High School. April 2 – Fitness, a Trainer’s Point of View, Deb Penner, Snap Fitness. April 9 – Bicycling for Fitness, Brice Erickson, B&L Bicycles. April 16 – Water for Fitness, Karen Johnston , Pullman Aquatics Center. April 23 – Fitness of Public School Children, Michelle Hyatt, Pullman School Dist. Nurse. March 5 – Terry Cornelison, Washington Small Business Development Center at WSU. March 19 – Judy Dunn, Whitman County Recycling & Waste Reduction Coordinator. December 18 – David Lui & Lauren Divine, PHS Students talk about 2008 Olympics and more. See Dennis for your own CD of Kiwanis photographs to enjoy! March 6 – Bobbie Ryder, Better Neighborhoods for Pullman. March 13 – Scott Adams, Regional Care Center nursing home plans. March 27 – Fritz Hughes – State of the Pullman Chamber of Commerce. Kerala Early Childhood Center she just launched in India. The Caterer will be Minh’s Bakery. Barb Olson, who helped in the first brainstorming. The caterer will be Heros N Sports. January 17 – Caterer will be Dinner in Minutes. They will also provide the program. January 24 – Rob Parish, manager of the Pullman-Moscow Regional Airport, will provide an update. January 31 – Karl Cozad will discuss the Community Action Center. Caterer yet to be determined. Thursday, October 4, 2007 – Brainstorming Session for new service projects, Barb Olson, facilitator. Thursday, October 11, 2007 – Debbie Jo Sherman, Director, United Way. Thursday, October 18, 2007 – United Way recipient agency. Thursday, October 25, 2007 – United Way recipient agency. Thursday, September 2, 2004 – Lenna Harding on James L. Dumas, Pullman Historical Figure. Thursday, September 9, 2004 – Don Orlich on School Testing and Local Control. Thursday, September 16, 2004 – S.M. (Ghazi) Ghazanfar on Stereotyping. Thursday, September 23, 2004 – Yujia (Peter) Wu on Some Interesting Research. Thursday, September 30, 2004 – Lane Rawlins on Washington State University. Thursday, July 1, 2004 – Charlene Jaeger, Vice President for Student Affairs, WSU. Thursday, July 15, 2004 – Don Bender, Director, Wood Materials & Engineering Laboratory and Professor of Civil Engineering. Thursday, July 22, 2004 – John Nilson, Director, School of Molecular Biosciences. Thursday, June 10, 2004 – Gary Bingham, WSU Department of Human Development, on Current Research on Families. Thursday, June 17, 2004 – Brett Meyers, Whitman County Sheriff. Thursday May 6, 2004 Circle K Club. Presentation of Present and Future Values. Thursday, May 13, 2004 Dan Skinner, USDA Research Leader. Thursday May 20, 2004 Rob Akey, Assistant WSU Football Coach. Thursday May 27, 2004 Scott Adams, Pullman Memorial Hospital Update. Thursday, April 1, 2004 The Fourth and Fifth R’s — Respect and Responsibility. Character education is the Schools. Three Educators from Hilltop Element School in Lynnwood, WA will present the program. Thursday, April 8, 2004 John David Wicker, Assistant Athletic Director for Event and Facility Operations. He’ll discuss recent and future facility projects for Athletics. Thursday, April 15, 2004 Pam Bradetich, Associate Athletic Director got Student-athlete and Staff Development. She’ll discuss student-athletic academic performance and athletic student-athlete development programs. Thursday, April 22, 2004 Anne McCoy, Senior Associate Athletic Director for Internal Operations. She’ll discuss financial issues in intercollegiate athletics and the WSU athletic budget. Thursday, April 29, 2004 Leslic Cox, Director of Marketing and Promotions. She’ll discuss the difference between marketing and promotions and what we are trying to do in each area to enhance Couger Athletics. Thursday March 4, 2004 Dr. Don Orlich, Retired WSU Professor of Education. “Washington Assessment of Student Learning, (WASL)”. Thursday, March 11, 2004 Dr. Clive Gay, College of Veterinary Medicine at WSU. “Mad Cow Disease”. Thursday March 18, 2004 John Kieran, Poet. “Poems I Remember”. Thursday January 8, 2004 Chris Pannkuk, International Natural Resource Consultant. “Agricultural Development in Afghanistan”. Thursday, January 15 2004 K. Duane Brelsford, Developer. Thursday January 22, 2004 Peg Motley from Wheatland Travel. Thursday December 4, 2003 Tom Rockefeller, Superintendent of Pullman Schools. “Update on Pullman Schools”. Thursday, December 11, 2003 John Irby, Professor in WSU Communications. “Kill the Editor”. Thursday December 18, 2003 Diane Smerdon and Anne Whelchel. “Christmas Music”. Thursday October 2, 2003 Lynne Nelson, Grizzly Bear Mom. Thursday, October 9, 2003 Debbie Sherman, Pullman United Way. Thursday October 23, 2003 Tim Steury, The Washington State magazine. Thursday October 30, 2003 Dr. Robert Ackerman, Archaeologist. Thursday August 7, 2003 Michelle Poesy and Fritz Hughes talking about the Lentil Festival, Tourism and the senic by-way program. Thursday, August 14, 2003 Rob Parish Pullman Moscow Airport and Tim Jamison pilot for Schweitzer Engineering. Thursday August 21, 2003 Chris Bruce the new museum of Art director. Discussing upcoming events and community involvment. Thursday August 28, 2003 Charles Knowles, U of I Faculty member, discussing Lewis and Clark in the Northwest..
Thursday July 10, 2003 Yellowstone National Park from the Inside. Connie Brown, School Counselor and former Yellowstone employee. Thursday July 17, 2003 “Take Me To The Fair”. Nancy Cochran, President, Palouse Empire Fair Foundation. Thursday July 24, 2003 America’s Natural Treasures-Bryce Canyon to Alaska. Sue Waller and/or Susie Gormsen. Thursday July 31, 2003 Nurturing Our Future Leaders. Deb Dzuk, WSU Foundation and Friends. Thursday May 1, 2003 Kay Innis “Relay for Life”. Thursday May 8, 2003 Roger Hayes “Community Colleges of Spokane programs in Pullman”. Thursday April 3, 2003 Annual meeting to elect officers. Circle K “Looking Back, Looking Forward with Thanks to Kiwanis”. Thursday April 10, 2003 Jim Cook, R.J. Cook, Endowed Chair for Wheat Research, and Ryan Davis, Farm Manager speaking on “A new WSU Precision Agriculture/Direct Seed Research Farm”. Thursday April 17, 2003 Community Building Luncheon. Pastor Glen Weber of Spokane will speak on “The Strength of the Faith Community in Society”..
Thursday April 24, 2003 John Rich and Gail Miller “Pullman Civic Theater”. Monday June 17, 2002 Tree dedication ceremony in honor of Maynard Hicks. 1:00PM Murrow Hall. Refreshments served after.